Mexican food is, without a doubt, some of the most delicious anywhere, with such variety and a range of flavors that leaves just about everyone totally delighted. We can say the same about the temptations that are available on a daily basis at street food stands all over México. The beautiful city of Mérida is no exception: you can find food stands almost everywhere and taste all the delicious things they have to offer. We set ourselves the pleasurable task of visiting some food stands in the city’s downtown area. Here’s what we discovered. 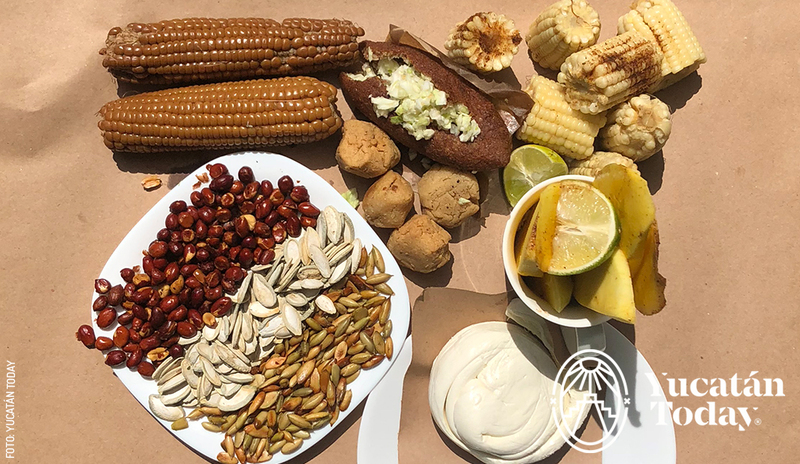 Located on a corner of the “piñata street,” this little dried fruits stand offers a variety of products such as peanuts, roasted and salted pumpkin seeds, and nuts, in different presentations, from 1 kg bags to smaller presentations for snacking on the go. Use them to accompany your meals, salads, or however you prefer. Take a stroll around Centro and look for the “piñata street,” where you’ll find the best source of nuts and dried fruit. This fresh cheese stall hails from Tabasco, with a guarantee of the very best flavor. There you’ll find string cheese ready to accompany your favorite dishes, with a delicious salty flavor that will make your mouth water just thinking about it. You’ll find the “botinero” cheese as well, prepared with carrots and a touch of jalapeño pepper, adding a hint of spiciness to your snacks. 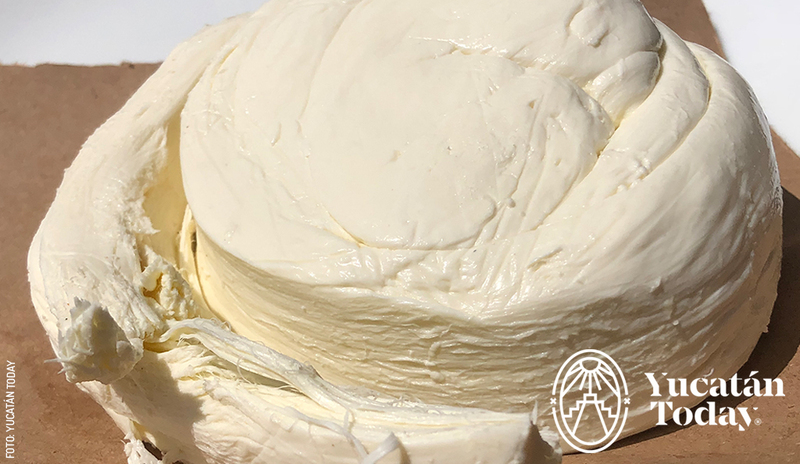 Use them any way you like, but don’t forget to head to Centro to find the best fresh cheese in Mérida. Every morning starting at 4 am, in a cooler on the sidewalk, you’ll find the coldest juices in Mérida’s downtown. Recover from the heat that begins in the early morning hours and doesn’t let up until the late afternoon. They come in different flavors like orange, melon, watermelon, “horchata,” even “chocomilk,” available in liter and half liter presentations, at an affordable price. Cool off while you enjoy these delicious and refreshing juices. Just half a block away, on Calle 56, you’ll find a stall inviting you to taste some local Yucatecan cuisine. 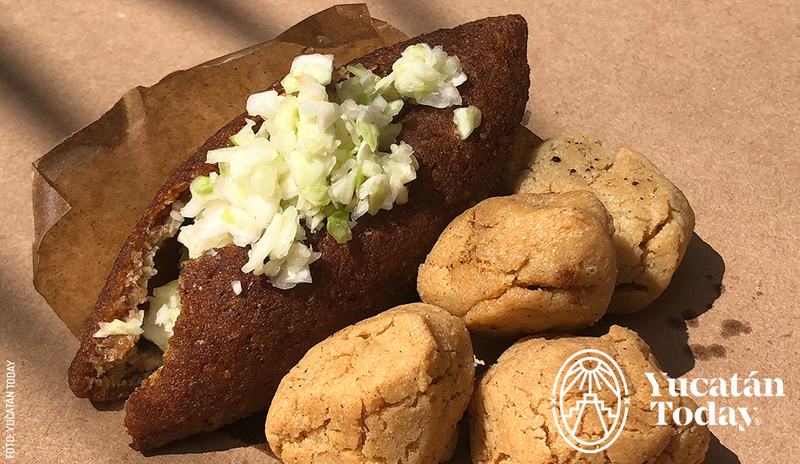 This street stall offers the traditional “kibis” (ground wheat with meat or cheese filling) and “piedras” (similar, but made from corn dough) ready to be enjoyed with pickled cabbage and chile habanero: good to the last bite. From Monday through Sunday you’ll find the locals lining up for this snack. Satisfy your hunger with these delicious local dishes! Fruits sprinkled with chile are the quintessential snack in Mérida’s Centro, and as good Yucatecans, we can’t let the opportunity of eating them pass us by, every time we go there. On the corner you’ll find a stall that offers a great variety of fruits, depending on the seasonal crop. Throw some chile powder and squeeze some lime juice on it and mix it up. You’ll immediately feel how your mouth starts to water as you get ready to enjoy this simple, delicious delicacy.